China may send manned flights to the moon and set up a base there by 2030 and it could land on Mars by 2050, a technology think thank said. In a roadmap for the development of China's space technology, the Chinese Academy of Sciences (CAS) said that China's manned spacecraft could also launch from a moon base to explore further planets in 2050. The roadmap was part of a report titled "Creation 2050: Science, technology and China's Future", a long-term strategy for the country's development of science and technology. 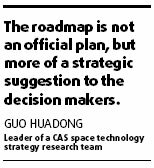 Guo Huadong, leader of a CAS space technology strategy research team, said the roadmap is "not an official plan, but more of a strategic suggestion to the decision makers." The central government has not announced any plan or timetable for sending astronauts to the moon or building a moon base. Guo said the report had been given to the central government for its consideration. "The roadmap has provided perspectives, based on China's current abilities, the international community's outlook in the field and the country's strategic needs," Guo told China Daily Thursday. 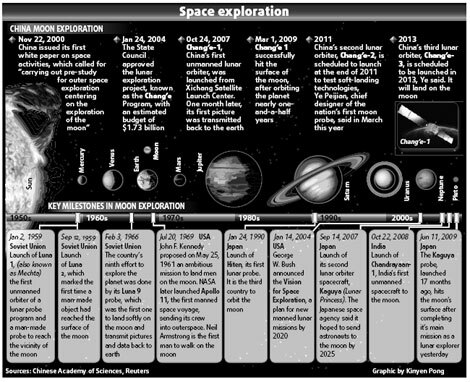 On the topic of deep-space exploration, the roadmap estimates that China's probes may reach Mars by about 2020 and be used to explore other planets like Jupiter by 2030. It suggests that the probes may fly out of the solar system and enter cosmic space by 2050. China's mission to Mars set for take-off in Oct.
As for a manned flight mission, the roadmap said China could have the capacity to develop technology that would guarantee astronauts' long-term survival in low-Earth-orbit space stations by about 2020. It also said that China could further develop technology that would improve the autonomous navigation capability of space vehicles, near-space vehicles and flight hardware. The Creation 2050 report covers 18 fields, including space, health, mineral resources, energy and agriculture, which could help the country become more competitive and assist in its sustainable development and security. Lu Yongxiang, president of the CAS and vice chairman of the Standing Committee of the National People's Congress (NPC), said at a conference Wednesday: "China cannot simply copy other countries' models of development of science and technology." China must try to develop a creative road in science and technology with it's own characteristics, he said. According to the report, China could be involved in the development of emerging strategic industries like energy by 2050. It could also be involved in the development of new energy and environmentally-friendly products, according to the report.